Error handling is an essential procedure in Visual Basic 2010 programming that helps make a program error-free. An error-free program can run smoothly and efficiently, and the user does not have to face all sorts of problems such as program crashes or system hangs.Errors often occur due to incorrect input from the user. For example, the user might make the mistake of attempting to enter text (string) to a box that is designed to handle only numeric values such as the weight of a person, the computer will not be able to perform the arithmetic calculation for text, therefore, will create an error. These errors are known as synchronous errors. Therefore a good programmer should be more alert to the parts of the program that could trigger errors and should write errors handling code to help the user in managing the errors. Writing errors handling code is a good practice for Visual Basic 2010 programmers, so do not try to finish a program fast by omitting the errors handling code. On the other hand, there should not be too many errors handling code in the program as it creates problems for the programmer to maintain and troubleshoot the program later. VB2010 has improved a lot in its built-in errors handling capabilities compared to older version versions of VB. In this example, we will deal with the error of entering non-numeric data into the textboxes that suppose to hold numeric values. The program_label here is error_hanldler. when the user enters non-numeric values into the textboxes, the error message will display the text"One of the entries is not a number! Try again!". If no error occurs, it will display the correct answer. Try it out yourself. Lbl_ErrorMsg.Text = " One of the entries is not a number! Try again!" 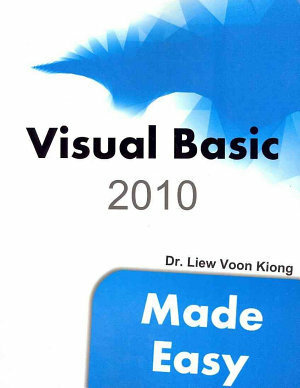 Visual Basic 2010 has adopted a new approach in handling errors known as exceptions handling. It is supposed to be more efficient than the old On Error Goto method, where it can handle various types of errors within the Try...Catch...End Try structure. This is a modification of Example 20.1. Instead of using On Error GoTo method, we use the Try...Catch...End Try method. In this example, the Catch statement will catch the exception when the user enters a non-numeric data and return the error message. If there is no exception, there will not any action from the Catch statement and the program returns the correct answer.